There are those moments in life when you have to pinch yourself a little bit. One of those was when James Villas asked me late in 2017 if I’d like to be an ambassador for them in 2018. I couldn’t believe it. Now here we are… we’re back from our Algarve villa holiday in Portugal! I think we’re now hook, line and sinker into the villa holiday. The options I received for the holiday were between Portugal and Cyprus and I just had to go with Portugal. We’ve actually been probably more than ten times before. A friend of mine has had a house there the past 14 years and we’ve been coming at least once a year before Kai came along. We even brought him out here last year to stay at the house. So the chance to bring him again and have our own villa and own space was welcomed! The villa we were given was part of the Classic Villas from James Villas and was called Casa Sol Nascente. When looking at it online it looked very traditionally Portuguese. The décor and style looked authentic to the area, just what you’d expect from the Classic range. It may not have all the super amazing mod cons of the Luxury Villas, but for a family of three wanting some quality time in the sun, near a beach and local towns… it had everything we needed. Now don’t get me wrong, we’ve done our fair share of all-inclusive holidays, I love an all-inclusive. BUT… I don’t know if I am the biggest fan of sharing a pool with a hundred other people or having loads of kids run around the pool and fight over who’s toy boat was whose and which inflatable they all want to ride. I guess in that respect it makes me prefer a little more of a private holiday, but we do find we spend a lot of time of the beach too. The fact you don’t have to cook or clean is fantastic when staying in a hotel. Sticking to restaurant meal times can be a bit annoying but hey, we all like routine don't we? But this holiday we’ve just returned from I think I am safe to say was one of the best holidays we’ve had as a family (and it’s not because I didn’t pay for it!). I think it was a perfect mixture of lots of things. Travelling with kids is a completely different ball game than before. You know that. So we made sure we had flights booked that were child friendly, and by that I mean not flying out at 6am like we did to Majorca in May. Having to wake Kai up at 2am wasn’t fun… So we made sure we flew out around 11am this time. Perfect time for us to wake up like normal and head off to the airport. We had the car picked up at departures by Help Me Park, again a real time saving idea. I reckon you must add on twenty to thirty minutes getting to the car park, finding a space, waiting for the bus, the bus journey to departures. We’ve always done that but I’m not sure we will again, I feel it’s worth the extra money, especially when you have a child/children. After the airport bag drop and security we had a nice big brunch to hopefully fill us up until we’d have time to eat in the evening. In no time at all we were on our flight to Faro, Portugal. It went so smoothly, Kai even slept (!?) which I couldn’t believe. He asked me “I have a little sleep, Daddy?”. Knock yourself out, son! He had an hour! What I love about Faro airport is the ease and no queues when it comes to arrivals. It’s way smaller than Gatwick so I get it, but I like the speediness of whizzing through security and getting your luggage. Within ten minutes from landing we were heading out to pick up our hire car from Hertz. We had a Mini Clubman. If you follow me on Instagram and saw my stories you’d know Kai was obsessed with his “new car”. Cars and keys are his thing at the moment. After a forty-minute drive we arrived at the villa and our first thoughts were “How big is this?!”. It’s on a huge plot of land overlooking the Algarve countryside. The sprawling terrace that goes all around the house, the pool, sun bathing area with sunbeds… not to mention indoors. The four bedrooms all decked out in a very traditional Portuguese style. It was lovely and clean on arrival and just felt so big. Our excited voices echoed around the house. It may have been large (four bedrooms, three bathrooms) but it did feel really homely at the same time. And child friendly too. There were no sharp edges or glass tables in sight! Perfect for an active four year old living there. Kai took no time in exploring every room. It was great to see him so excited over it all. James Villas provided us with a welcome hamper of goodies which was filled with the essentials. We needed more that night though, we were starving for a big dinner and we wanted to stock up for the week so we headed to our favourite mall; Algarve Shopping! 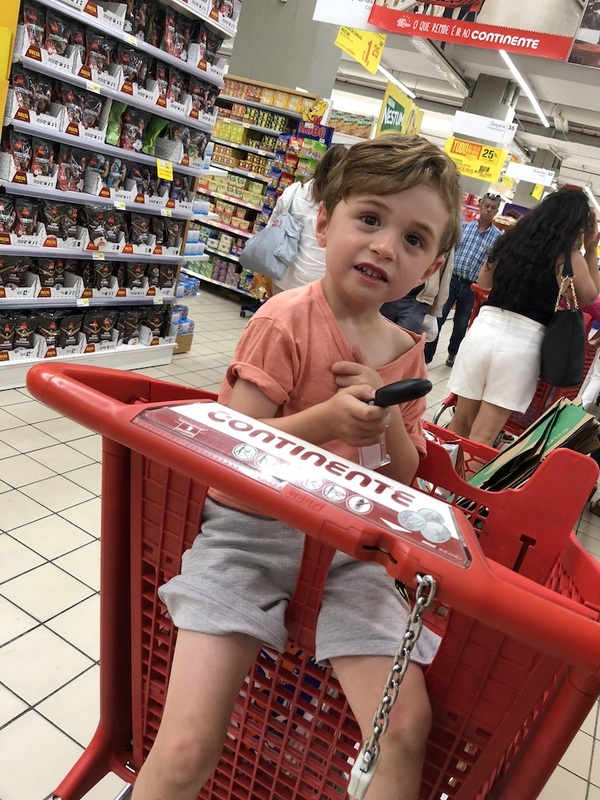 The supermarket, Continente, is there and it has everything we’d need… including a load of pool inflatables for Kai to spend his pocket money on. Once we had sussed the house out we got in the car and headed to the mall and had dinner there too. We were back home and had Kai in bed by 9pm so we could unpack. Each bedroom had big wardrobes, more than enough space for us all. We were shattered and after venturing to the pool and having a quiet ten minutes with a cuppa we were in bed ourselves. The days after this all merge into one lovely, big holiday bubble of sunshine, food, the pool, beaches and smiles from one little man and his dads. We had such a good time. It took Kai a couple of days I think to really settle but we had a pool day on our first full day and ate at the villa. So we were at ‘home’ and just getting used to our surroundings. James Villas say the villas in the classic range are like 'home away from home' and it really was. We had the chance to prep food that we wanted and drink what we wanted to drink. For me, walking out of the patio doors down to the pool with the sun on my back and holding a tray of food and drink for my boys’ hands down beats heading to a busy restaurant where we all eat from a buffet. The villa just felt so much more ‘at home’ and personal. Like I said, we’re sold. Oh, not to mention I must’ve done about three loads of washing, eventually coming home with no dirty washing. My parenting holiday dream realised right there! We noticed on the first day that the Wi-Fi really wasn’t very strong and I actually saw this a great opportunity to truly switch off and just enjoy a book in the evening but the iPad for Kai and my blog work really did need a decent Wi-Fi connection. The next day two lovely, old gents popped round. Both Portuguese but one spoke English and translated for him. They looked after the gardens and did all the handy jobs for the villa. I also went to pick up the poolside shower on day two and it literally felt apart in my hands. It must have been the heat making the plastic so brittle. I told the contact we had back in the UK from James Villas and whilst we were out for the day a new shower was fitted by these chaps. I couldn’t believe it. They were so lovely and made it clear they wanted us to have the perfect time. We were genuinely impressed at the service. We headed out for breakfast everyday as we were spoilt for bakers in Armacao De Pera and they all make a mean egg sandwich or ‘tosta mishta’ (ham and cheese toastie). Those are literally the only options you get for breakfast in Portugal but I love me some bread so I was okay with that. Just having the car and that freedom to explore new places made the holiday all the better, we didn’t feel stuck to one place. We love an adventure so to find new and different beaches and restaurants for dinner was exactly what we wanted. You can never have enough peri peri chicken, right? And you can never get lost really thanks to Google maps. We met friends whilst we were out there who were visiting too. Nanny and Grandad were also holidaying in the Algarve at the same time as well so we got to have a pool day at the villa with them. Kai loved having them there and showing them around… and getting grandad wet by the pool! Just wonderful memories made, all at our base, the villa. We’re beach people too, so we headed to beach most days. Gale beach is our favourite without a doubt. For about €15 you can get yourself a couple of beds and a table with an umbrella. The umbrella is essential in the summer months. Kai loves the beach and we love seeing him on it. We jumped waves, made kingdoms out of sand (that he’d knock down like Godzilla) and explored the beaches amazing rockpools catching little crabs and shellfish. I must’ve lost all the holiday weight I would’ve gained from the bread when running back and forth to sea to collect buckets of water for him… Just typing this now has me yearning for that beach smell and the feeling of the cool sea lapping at my feet. The location of the villa we stayed is excellent. Five minutes in the car from the local town and beach and not far from anything else. You’re always about fifteen-twenty minutes away from anywhere in the Algarve I find. We popped into Albufeira on our last day with nanny and grandad because… well, you have to do Albufeira. Just maybe not in the evening with a four-year-old. The villa was very much part of the classic range from James Villas. It was never going to have the grandest of accessories or opulent dining spaces… but it’s a real family home that was private and not overlooked at all. Yes, the showers may not have been powerful enough for me, but it was a fully functional, clean house with so much space and everything you’d need (cutlery, crockery, dishwasher, washing machine, TV) for the family to stay in. The pool was a good size and very clean. There were plenty of sunbeds around the pool too that have very comfortable toppers. You’ll also be spoilt for towels. We had enough for a fresh towel a day and then they were replenished half way through the stay. This post was written in collaboration with James Villas as part of the James Villas Ambassador programme for 2018. Visit my instagram to view my highlighted stories from our trip here!